Join the engines Thomas, James, Percy, Emily, Gordon and their new friend, Nia, in this fantastic slipcase collection of 6 little board storybooks. This reissued Thomas & Friends Pocket Library is the perfect size for young children to enjoy here, there and everywhere. It features the best-loved stories of Thomas, James and Percy from the original library plus three brand new stories about Gordon, Emily and Nia. This set is small enough to carry with you, so the books can be used to entertain children wherever you go. Children will also love placing the book back covers in the right order to reveal a big picture of Thomas and his friends. 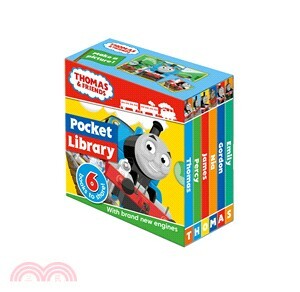 The Thomas and Friends Pocket Library is a great collection for young children to enjoy again and again.